Founded in 1949 by Harry Blech to delight audiences with the works of Mozart and Haydn, the London Mozart Players is the UK’s longest established chamber orchestra. Known for its unmistakable British roots, the orchestra has developed an outstanding reputation for adventurous, ambitious programming from Baroque through to genre-crossing contemporary music. LMP has enjoyed a long history of association with many of the world’s finest artists including Sir James Galway, Dame Felicity Lott, Jane Glover, Howard Shelley, Nicola Benedetti, John Suchet and Simon Callow. The orchestra enjoys an international reputation, touring extensively throughout Europe and the Far East, most recently Dubai and Hong Kong in 2018, and records frequently for Naxos, Chandos and Hyperion Records. The London Mozart Players regularly performs on London’s premier concert platforms, including the Royal Festival Hall, St John’s Smith Square and Cadogan Hall as well as cathedrals and other concert venues across the UK. LMP is the resident orchestra at Croydon’s Fairfield Hall and will celebrate this venue’s reopening after refurbishment in 2019 with a gala concert which will also mark the orchestra’s 70th birthday. The orchestra’s anniversary year will see a wide range of concerts in the capital’s top concert venues including performances at Kings Place, Conway Hall and a return to Southbank’s Queen Elizabeth Hall. As resident orchestra of Croydon for nearly 30 years, the ensemble has shown an invigorated and growing commitment to the borough’s cultural life. In 2016, LMP relocated its office from Fairfield Halls to St John the Evangelist, Upper Norwood, undertaking a rich programme of initiatives within the local community. The orchestra has brought classical music stars Nicola Benedetti, Leonard Elschenbroich, Sheku Kanneh-Mason and Thomas Trotter to Upper Norwood in world-class performances, and has implemented a tailored calendar of events including specialist family concerts and inclusive collaborations with local community groups and schools. As one of the original pioneers of orchestral outreach work, LMP has enjoyed a host of relationships with schools and music hubs across the UK (and recently in Dubai and Hong Kong), working with many teachers and heads of music to inspire the next generation of musicians and music lovers. As well as working with schools, LMP continues its 70-year tradition of promoting young up-and-coming musicians. Nicola Benedetti, Jacqueline du Pré and Jan Pascal Tortelier are just three of many young musical virtuosi championed early in their careers by the orchestra. The orchestra’s award-winning 2017 series #LMPOnTheMove saw the ensemble pushing the perceived boundaries of classical music performance in Croydon, welcoming new audiences and partnerships. From performing a live film score on top of a shopping mall car park, to playing a house music set at Boxpark with young DJ/producer Shift K3Y, OnTheMove was commended for its innovative outlook and success in reaching the diverse communities of the borough. #LMPOnTheMove 2018 launched in May with an equally diverse programme, and the 2019 series is already planned. The LMP enjoys a special relationship with its audience and has thriving Friends and Sponsors programmes. The orchestra always tries to break down the ‘fourth’ wall between musicians and audience, and this is achieved in part as the orchestra is self-directed. Many concerts, such as its acclaimed ‘Piano Explored’ series, involves a ‘deconstruction’ of the works on the programme, allowing greater understanding and engagement with the music and with the musicians themselves. LMP is the only professional orchestra in the UK to be managed both operationally and artistically by the players. The orchestra has enjoyed the patronage of HRH The Earl of Wessex since 1988. The LMP is founded by its Artistic Director Harry Blech, who gives the first concert at Wigmore Hall, an all-Mozart programme featuring violinist Neville Marriner. The Haydn-Mozart Society is created. William Walton is appointed Chairman, and committee members include Alan Rawsthorne. Regular concerts are given in Chelsea Town Hall. The BBC’s Third Programme invites the orchestra to perform Haydn’s six Paris Symphonies over a number of evenings. The BBC stages an extensive, high profile Mozart Festival at the RFH. The LMP’s first tours abroad are taken, including visits to Amsterdam, Italy and Sicily, and East Germany. The Haydn-Mozart Society is approached by architect William Brook-Holding Jones suggesting the installation of a Mozart memorial outside the house in which he lived during his only stay in London as a young boy. 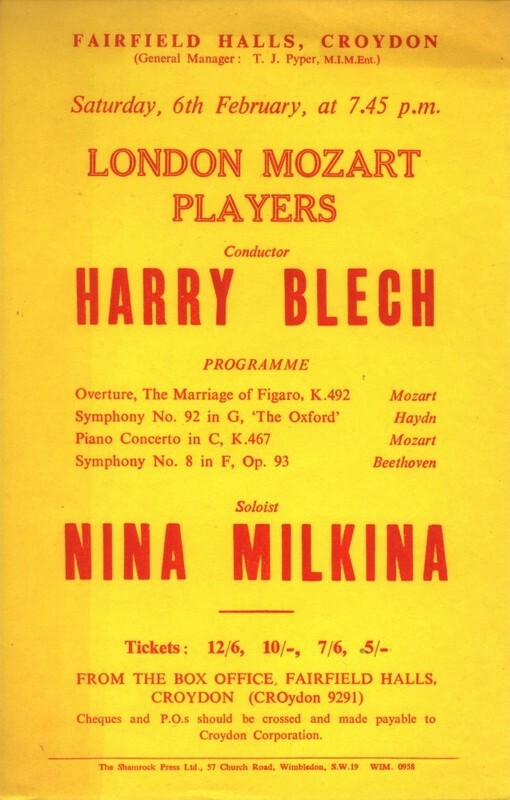 Although insufficient funds are raised, sponsors including Yehudi Menuhin, Sir Arthur Bliss, Sir William Walton, Myra Hess and John Christie instead are able to fund the new Mozart Memorial Prize. A young Jacqueline Du Pré performs with the LMP whilst still at student at the Guildhall School of Music. The LMP under Harry Blech gives its first concert at Fairfield Halls with pianist Vladimir Ashkenazy, and makes its debut at the BBC Proms. The LMP is conducted by Igor Stravinsky in a concert of his own works at the Athens Festival. The orchestra’s activity by now includes past visits to over 200 cities with over 200 soloists and eleven guest conductors. Featured soloists at the RFH concerts include John Lill, Murray Perahia, Vladimir Ashkenazy, Tamás Vásáry, Andras Schiff and Dimitri Alexeev. 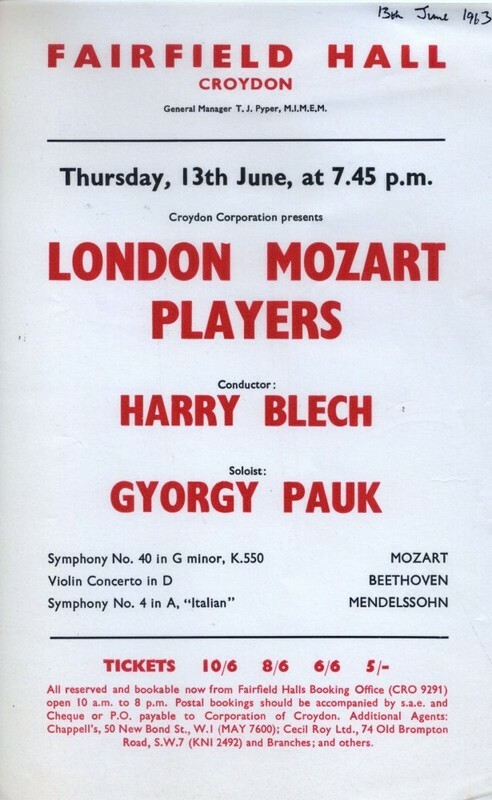 Gyorgy Pauk features as a soloist in a concert at Fairfield Halls. A new relationship with BP includes sponsorship of a variety of music education projects. Mark Elder is appointed principal guest conductor. Harry Blech retires, with a ‘Farewell Concert’ of Haydn, Mozart and Schubert at the Royal Festival Hall.Jane Glover is appointed Artistic Director, launching her ‘Mozart Explored’ programmes which include Simon Callow reading letters from Mozart, and a ‘Beethoven in Context’ at the RFH. A broader range of repertoire is introduced under Glover’s leadership, including many new works, as well as extensive touring to Europe and the Far East. Jane Glover presents BBC TV series Mozart – his life with Music, broadcast in 6 episodes featuring the LMP. The ‘Music of Two Decades’ programme launches at London’s Queen Elizabeth Hall, featuring nine concerts combining music from 1780s with the 1980s. Composers are featured, and include interviews with Oliver Knussen, Robin Holloway, Jonathan Harvey, George Benjamin and Alexander Goehr. 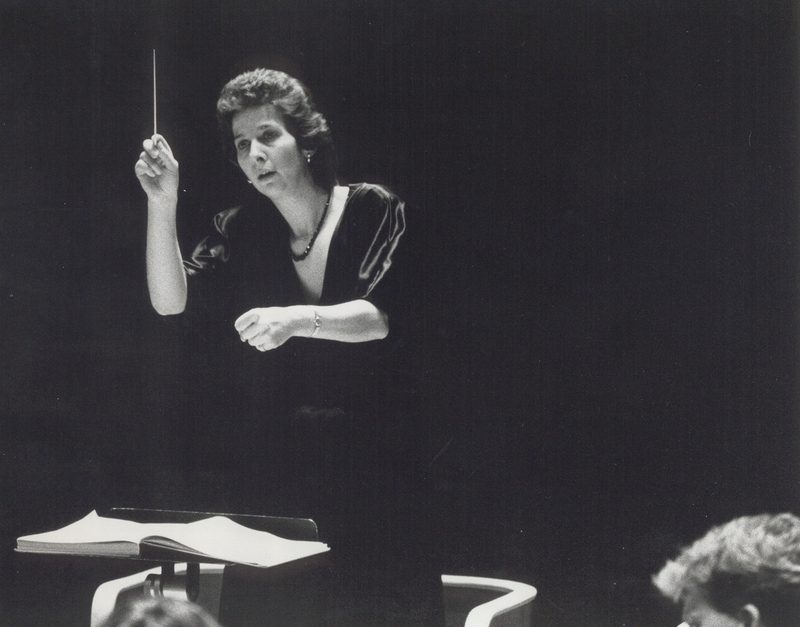 Soloists include Dame Janet Baker, Stephen Hough and Imogen Cooper. 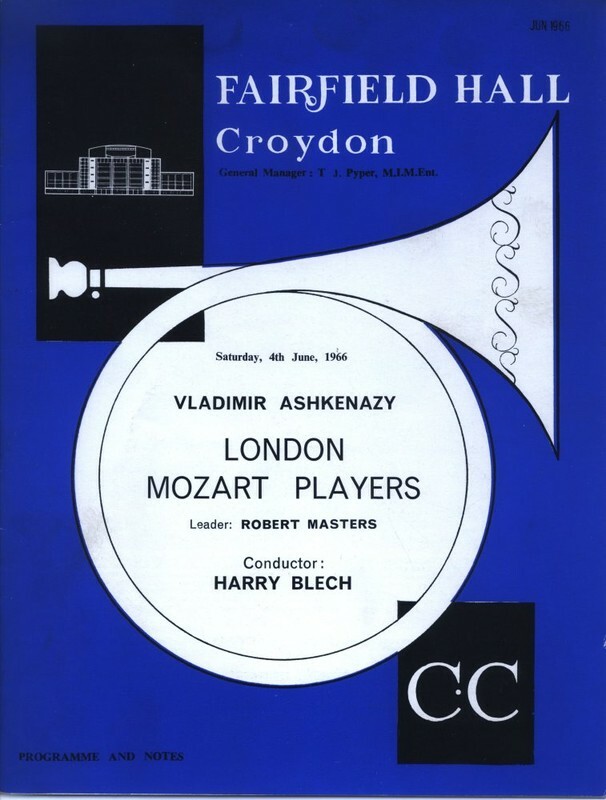 The London Mozart Players becomes resident orchestra of Fairfield Halls, Croydon and of the London Borough of Croydon, following a highly successful concert series supported by Greater London Arts. 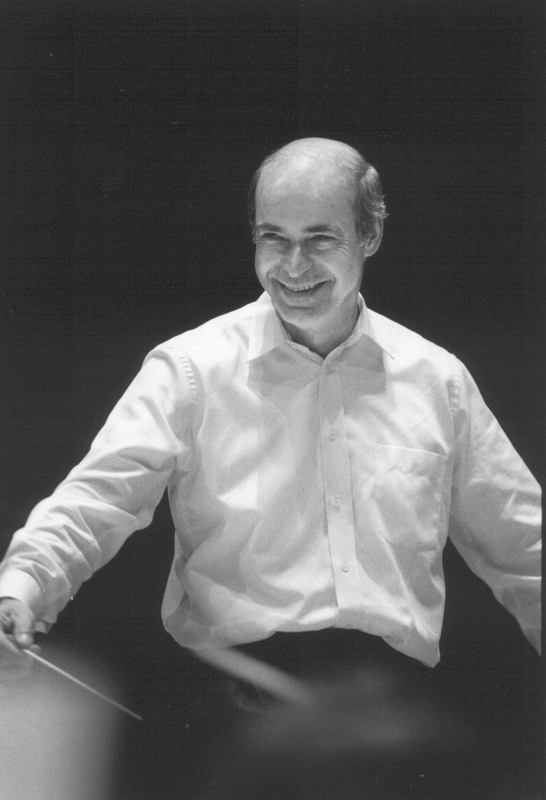 David Juritz becomes leader of the orchestra. The LMP’s fortieth anniversary concerts feature a complete performance of A Midsummer Night’s Dream with the complete incidental music by Mendelssohn at the Barbican Centre. The orchestra is joined on platform by a host of leading Shakespearean actors including Peter Eyre, set against a backdrop of projections of set designs from Charles Kean’s 1856 production of the play. Other celebrations include an all-Mozart BBC Prom and a repeat of the LMP’s first ever concert in 1949 at the Wigmore Hall. Croydon-based global brand Nestlé UK joins the LMP as principal sponsor, funding much of the orchestra’s education and community programme including its Kid’s Club Network initiative. HRH The Earl of Wessex becomes patron of the LMP, playing an active part in the life of the orchestra by supporting fundraising events at Windsor Castle, St James’s Palace and Buckingham Palace. Volkswagen becomes a corporate sponsor of the orchestra. The ‘Volkswagen Tour’ ‘Mozart in Focus’ concerts celebrate the composer’s centenary with eleven concerts over seven months throughout the UK, directed by Jane Glover. Soloists include Howard Shelley, David Juritz, Julian Lloyd Webber, and Felicity Lott. A live televised performance of Mozart’s Masonic Funeral Music and the Requiem is given in St Paul’s Cathedral 200 years to the day since his death. Following a tour of the Far East with Vanessa Mae, Jane Glover retires as Music Director. Her successor Matthias Bamert is appointed, with Howard Shelley as Associate Conductor. The LMP celebrates its 45th anniversary. Générale des Eaux Companies develops its sponsorship of the orchestra, including the support of four concerts annual at the South Bank Centre and the new ‘Contemporaries of Mozart’ recording series on Chandos. LMP’s inaugural residency season at The Anvil, Basingstoke is launched. The LMP performs at the BBC Proms in its centenary year with a programme of works by Britten and Mozart, plus the world premiere of Sally Beamish’s Viola Concerto by soloist Philip Dukes. Matthias Bamert retires, Andrew Parrott takes up the position of Music Director and James Galway becomes Principal Guest Conductor. The LMP celebrates its fiftieth anniversary with a gala concert, the same all-Mozart programme performed in the orchestra’s very first concert. Commissions include new works from Michael Nyman and saxophonist John Harle. A BBC Proms concert includes works by Beethoven, Haydn and Judith Weir. LMP’s annual Remembrance Day service with Portsmouth Grammar School is established. This ongoing commissioning programme will include premieres by Sir Peter Maxwell Davies, Tarik O’Regan, Sally Beamish, Cecilia McDowall, Lynne Plowman, Tansy Davies and Roxanna Panufnik. The LMP tours to Austria with James Galway, and ongoing residencies at St John’s Smith Square, the Anvil, Basingstoke, and Turner Sims Concert Hall, Southampton. A family concert features the world premiere of Jonathan Dove’s The Crocodiamond with narration by Simon Callow. The LMP’s fifteenth performance at the BBC Proms includes music by Schnittke and Mozart. A brand new residency is formed in the rural district of South Holland, Lincs, bringing concerts and community participation to the region. The LMP celebrates its 60th anniversary with a concert at Fairfield Halls in the presence of its patron, HRH the Earl of Wessex, with soloists Dame Felicity Lott and Howard Shelley, broadcast on BBC Radio 3. Celebration concerts also include the first performance of Lynne Plowman’s new score for the 1919 silent film The Cabinet of Dr Caligari, and the premiere of RESOUND, a work featuring fragments of Mozart’s unfinished chamber music and excerpts of archive recording material of the LMP in their earliest years of existence, played as a blurring of live and recorded sound. Conductor Gérard Korsten joins the orchestra as its fifth Music Director and Hilary Davan Wetton is appointed Associate Conductor. As with Voices and with Tears, composed by Tansy Davies and performed at Portsmouth Cathedral by the LMP and Portsmouth Grammar School is nominated for a South Bank Sky Arts 2011 Award. Roxanna Panufnik is appointed Associate Composer. The LMP participates in the London 2012 Cultural Olympiad ‘Music Nation’ with the world premiere of Panufnik’s Four World Seasons, and the orchestra performs the official gala concert for Fairfield Halls’ fiftieth anniversary celebration.